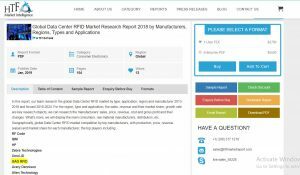 Global Data Center RFID Market Research Report 2018 by Manufacturers, Regions, Types and Applications - GAO RFID Inc. Global Data Center RFID market research report analyzes sales, revenue, market share and growth rate of data center RFID market from 2013 to 2018 and forecasts the same for 2019-2024. Sales, prices, revenue and Market share of key manufacturers are studied. GAO RFID is cited as one of the key players in the data center RFID market. GAO RFID offers a complete solution for deploying RFID on IT assets in data centers. GAO Data center RFID solutions allow to optimize asset utilization, reduces cost, allows real-time tracking, security management, and improves risk mitigation at data centers.